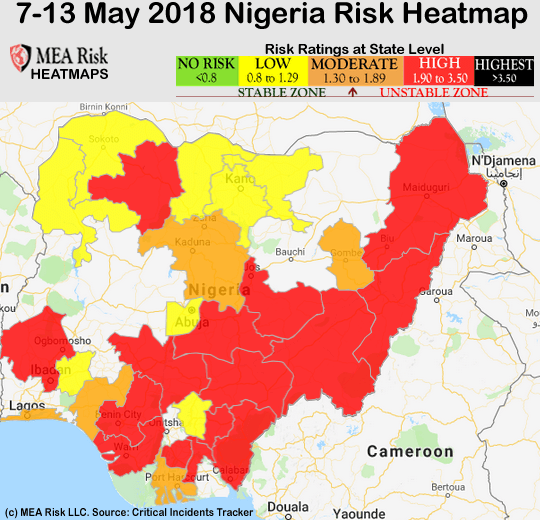 MEA Risk – May 14, 2018; For the period of 7 to 13 May 2018, there were 53 critical incidents in Nigeria, resulting in 134 deaths and 215 arrests. Incidents related to the Human & Social category and the Criminality category accounted each for 24.53% of the total incident pool of the week. Tension escalated by a notch this week between the Nigerian police authorities and the Senate over MPs anger at the refusal of Inspector General of Police (IGP) Ibrahim Idris to testify before the legislative body. Refusing to honor the senate subpoenas on three occasions, Idris said he has no apology for not appearing. Meanwhile, police authorities announce that they will sue the senate to nullify its resolution against the IDP. Meanwhile, Nigeria’s Vice President Yemi Osinbajo named three former government officials whom he accused of stealing $3 billion from a Nigerian National Petroleum Corporation (NNPC) contract during the administration of President Goodluck Jonathan. Former Minister of Petroleum Resources Diezani Allison-Madueke is among the three named. On the security front, killings, mostly in the center of the country continued, with at least 45 people killed in an another attack in Birnin Gwari, Kaduna state on 5 May. In Nasarawa, at least three people were killed by unknown gunmen in attacks in Keana targeting ethnic Tivs. In Benue, several people were injured in Guma on 9 May, in a new attack attributed to herdsmen. 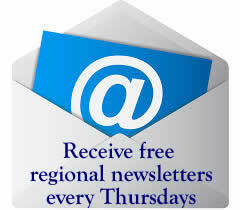 In Adamawa, at least eight people were killed in an attack in Numan. The gunmen are believed to be herdsmen. In Taraba, nine people from Ussa were killed by an unidentified gang on 9 May. Nigeria has also seen this week a series of security blunders with agents from various security units fighting each others. These incidents are indicative of a security system that boasts poor professional practices and ethics, crippling the country’s efforts in dealing with real crime. In Ijora, Lagos, policemen and naval officers engaged in a fight over mundane issues, with two policemen sustaining severe injuries. Elsewhere, soldiers and policemen attached to the Abuja Environmental Protection Board clashed with officials of the Federal Road Safety Commission over a violation notice. In Bayelsa, army soldiers and agents of the Nigeria Security and Civil Defense Corps clashed over the seizure of two oil tankers and who should be in charge. The worst case this week took place in Yaba, Lagos, where the police raided a Church and are now accused of killing four people in the confrontation. At least ten people were killed in a communal clash between the people of Ikot Offiong in Odukpani local government area of Cross River State and Oku Iboku in Itu local government area of Akwa Ibom State. Land ownership and border demarcation have been the sources of this communal conflict for decades. Lassa Fever is suspected to be behind the death of a health worker in Ondo, sparking fear that the spread of the disease could reignite, after it was declared to be under control. Meanwhile, health authorities are stepping up surveillance at all entry points to prevent an outbreak of Ebola, currently detected in the DR Congo. Escalating tension both on the political front and in communal conflicts risks worsening the general security environment in Nigeria. Political parties are dealing with divisive governance, with leadership conflicts that turn violent. This situation is likely to continue and will probably worsen as we approach the 2019 general and presidential elections. Meanwhile, the center and eastern parts of the country remain engulfed in what appears to be a civil war. What started as an economic war of sort, with nomadic herders using violence to graze their cattle, is now quickly shifting into a multidimensional crisis involving religion, tribalism, regionalism and ethnicity. In this explosive environment, the federal government remains unable to stem the violence, generally attributed to herdsmen, but which is likely fueled by powerful groups seeking to destabilize Nigeria. This environment of heightened instability will continue, short of a substantial policy shift that would force a peaceful negotiation of ongoing crises. Among the biggest issues facing the Nigerian leadership is the lack of professionalism among the country’s security services. This week’s incidents involving unprofessional behavior from the police and military personnel in Lagos, Abuja, and Bayelsa are indicative of a security system that appears to fall out of control of the country’s leadership. Criticism from Amnesty International on how the military is prosecuting its war on Boko Haram and other groups are indeed no trivial and are a sign that Nigeria needs a major overhaul of its security apparatus. On the Social/Human front, while Nigeria faces a series of hard-to-solve social issues, health and environmental problems will continue to magnifying the state of instability across the country. Although authorities believed they controlled the propagation of Lassa Fever, there is growing risk of the outbreak reigniting as a new victim was reported in Ondo state. There is also heightened tension over the risk of an Ebola contagion, despite the epicenter, DR Congo, being far from Nigeria. On the environmental front, the weather system is entering a phase of instability with heavy rains and storms expected to hit several regions, as they did this week in Borno and Bauchi. Economically, Although there has been no major release of economic data this week, the reduction of credit to the private sector is indicative of a lack of economic growth and opportunities facing Nigeria’s private sector companies, and the economy at large. The fundamentals of the economic outlook remain the same. Despite an improvement of the country’s revenue outlook, owing to an increase in oil prices, the structural issues facing the Nigerian economy are daunting, and will represent an obstacle to sustained and long-term growth.